Two months ago, on February 5, Fit Quickies: 5 Minute Targeted Body Shaping Workouts – – was officially released. And to say THANK you for your enthusiastic support – and that you made Fit Quickies a best-seller at launch – I’ve got a special offer for you if you’ve had your eye on the Fit Quickies downloadable video collection. To my loyal readers I am extending an ultra-quick and super Fit Quickies THANK YOU special. When you buy 3 new copies of Fit Quickies: 5 Minute Targeted Body Shaping Workouts, I will send you the entire Fit Quickies video download collection as a thank you gift – at no extra cost for the videos themselves. The video collection is priced at $97 (value $150). You’ll get it as a gift by simply purchasing 3 new copies of The Fit Quickies Book. That means if you have haven’t bought a copy of the book yet, you’ll now have one for yourself, 2 to give away as gifts to friends, and the entire Fit Quickies video collection for YOU! And if you already have a copy, you will have 3 new copies to give as gifts to friends andfamily – along with the videos. That’s 19 videos and 20 transcripts. That’s a $97 bonus gift for your purchase of 3 books. But this thank you special will last 3 days only. 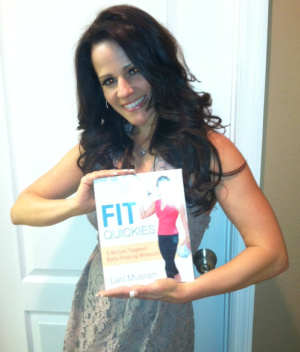 1) Purchase 3 NEW copies of Fit Quickies: 5 Minute Targeted Body-Shaping Workouts (Amazon, B/N, or your favorite vendor! Find the links here: http://www.lanimuelrath.com/the-book. Yes, these need to be NEW purchases with the date stamp of April 6, April 7, or April 8, 2013 on the receipt you forward to me. This offer cannot be combined with any previous purchases of the Fit Quickies book. 3) You will then be sent the access code to download your complete Fit Quickies video collection. Remember, 3 days -Saturday, April 6 – 8, 2013, and the first 50 in only. And thank you , once again! What a FABulous offer! I just sent you my receipt. I just love this book and now I have 3 fresh copies to give to friends. Thank you for this opportunity, you’re the best! Hi Jen! Got your receipt -did you receive your gift? Thank you for your as always enthusiastic support and joy about the whole process! This is a great idea! And congratulations on such a great book. I have a copy already but will be getting 3 more today. Can’t wait to see the videos! That is fantastic! You’re not alone – some have told me they are doing early Christmas shopping with this celebration!